This is adapted from a cutting from The Independent of about 15 years ago. I love a trifle made with just one fruit; it’s such a celebration of a particular flavour. Bought custard will do, but ensure it’s a good one. A day in advance, heat 500ml water with 200g sugar, the juice of 1 lemon and the peel. Add the apricots – poach until they are tender but still holding their shape. Set them aside with the peel; reduce the syrup by two-thirds over a high heat and set aside. Crumble the amaretti into a glass bowl, then lay the sponge fingers over. Spoon on 6 tbsp brandy and about 200ml poaching liquor. Spread over the jam, half the almonds and the apricots. Cover and refrigerate overnight. For the custard, put the vanilla pod and seeds in a heavy-based pan with the cream and milk; heat until almost boiling. Allow to cool and infuse for 20 minutes, then remove the pod. Beat the yolks and sugar and drizzle on the milk mixture while stirring. Put over a low heat and stir until thick enough to coat the back of a spoon. Don’t let it boil. Pour into a bowl and leave to cool. Spoon the custard over the apricots in the bowl, cover and put back in the fridge for 15 minutes. Put the remaining lemon juice in a bowl with 40g caster sugar. Slowly pour in the whipping cream and whisk until it holds its shape, gradually adding 2 tbsp brandy. 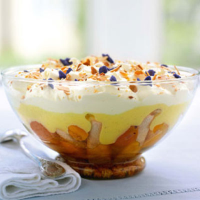 Spoon the cream over the trifle; scatter the remaining almonds on top. Add the crystallised violets just before serving. Bordeaux, France. Bin 642288; £9.99.